I'm always in the kitchen throwing random concoctions together, and today I decided to make myself a scrub as I had ran out and forgot to purchase. I was thinking that it would be a great last minute gift idea paired with some flannels and a box of chocolates and wanted to share. I mixed up my coconut oil first, I used the 'Nutiva' organic extra virgin, added the juice of 1 lemon, added a spoonful of honey, and added sugar until it was the consistency I wanted. I then added a few drops of lavender essential oil to help preserve it and for a stronger scent. You can use whatever oils you have at home, olive oil, almond oil, avocado oil will also work great too, you could use oranges instead of lemons and add cinnamon or other spices, the possibilities are basically endless. I love home made skin care and am always slathering some kind of fruit on my face. This scrub can be used on the face, body, hands and feet. 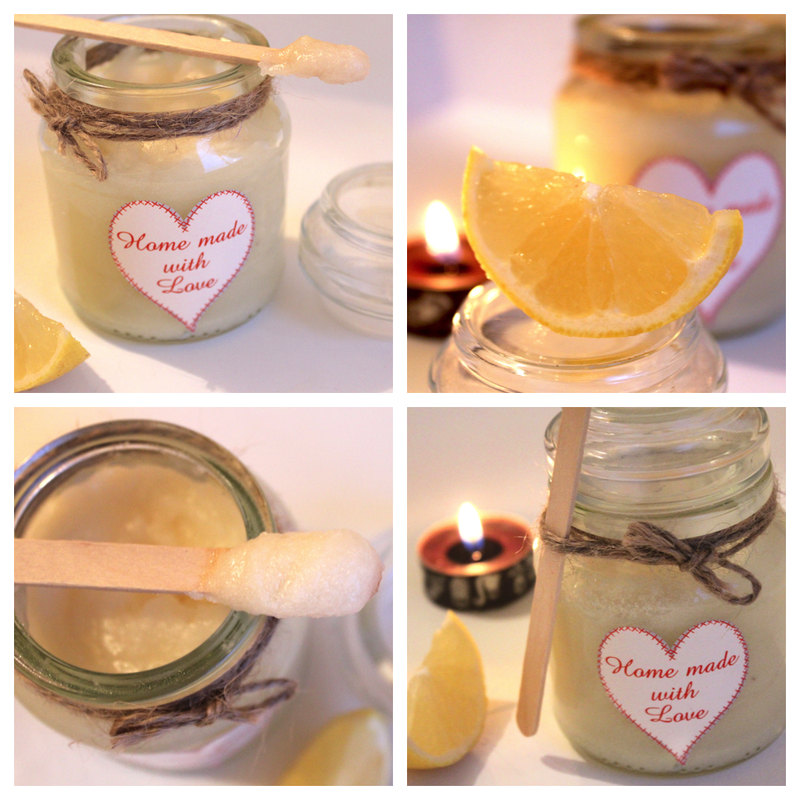 The lemon has lactic acid so perfect for renewing the surface, the sugar I used was fine granulated sugar so it's extremely gentle, it smells very citrusy and amazing and I'm sure it would be a treat to use for everyone. The coconut oil and honey adds extra moisture and feels great on the skin. I added stickers from 'Butlers' which are for jam but fit for this purpose, threw on some twine and a lollipop stick as a spatula. I always keep empty jars and this was a mini Douwe Egberts coffee jar. Go on, get creating your own skincare, sometimes I wonder why I even buy any it's so much nicer homemade and natural. Will you be making any DIY gifts this year? Hello all, I wanted to check in with a toddler post as I am obsessed with finding Esra engaging educational toys as I am finding my latest favourite shade of lipstick. I did a post a while back on 'Wooden baby toys' and now it's time for the toddler version! I store most her toys in a cupboard and pick a few out the night before to help keep her busy for the next day. I am very much intrigued by the Montessori method but also like the idea of some free choice. I like rotating toys so they don't get boring and can be used as a reward system. I also make up a lot of my own activities and games but it's also nice to have the 'ready made' toys too. Esra loves arts & crafts, sensory play, musical instruments, she also loves smelling different scents and does a lot of dancing and prancing around in tutus whilst cooking in her play kitchen. However, she gets very excited about toys just like all children. I purchase most on amazon and add them to my wish list then purchase when they go on sale. I am an amazon app addict, help me please! Alphabet, number and animal peg puzzle from Sainsburys. Eric Carle puzzle from 'Natural History Museum' also available HERE. These are great to help with early letter, number, colour and object recognition, we've had these since she was about 11months, but she still uses them at 25months. She can place all of them correctly with no help and makes the animal sounds and screams the colours out. It's very important to try and get your toddler to talk about the puzzle and ask her questions to help with her speech. I love the Sainsburys puzzles as they were about £3, Melissa & Doug also do some superb ones but it's good to check your local supermarket for cheaper options - Asda do some great ones too. Ok so, jigsaw puzzles are my latest craze, Esra's first "real" non peg board puzzle was the fairy set which she completes confidently on her own as they are 2 and 3 piece puzzles. The M&S ones we do together and they are such great quality, very sturdy and colourful. I have just ordered some more tonight as they are all on sale! Orchard Toys have some lovely puzzles and I have several more on my list. Jigsaw puzzles are great for brain training and also lots of fun, they can be played like a game taking turns or left independently to help build confidence. It's best to start with smaller pieced puzzles to help the child feel a sense of achievement when completed. Esra also thought of a new game where once the puzzle is completed it's pushes under the sofa to hide and mummy has to find it. :) Anyway so, puzzles puzzles puzzles all the way. If you are stuck for a gift buy a puzzle! The clock is amazing, Esra is learning her shapes and colours and can confidently put them all back in there places. It's a toy that will grow with her and help her to tell the time when she is a bit older. The bear puzzle is SO entertaining, she tells me the bears are cold and then dresses them up over and over again. The first day she got it she played with it for AGES, it also helps to recognise emotions and how to dress according to the weather - big thumbs up. The Dinosaur number puzzles where such a great find from the charity shop, I paid about £3 for it and it's just perfect to help with counting whilst putting the jigsaw together which she can all do independently. Crazy Characters Game from Marks & Spencers. Easy games to help with turn taking is so important, I am obsessed with Orchard Toys, they make the best puzzles and games and provide such good fun for toddlers, everything is well made and sturdy and will last for years. These games are invaluable when it comes to brain training, they help with memory, counting, and recognition and much more! I picked up the spotty dog game from a charity shop for £1.95, gave them a wipe and they are as good as new. I have my eye on the alphabet lotto, once upon time dominos and shape snap - it's seriously addictive. The character match game is also fun and can also be used just as a puzzle. Lacing cards by Eric Carle. 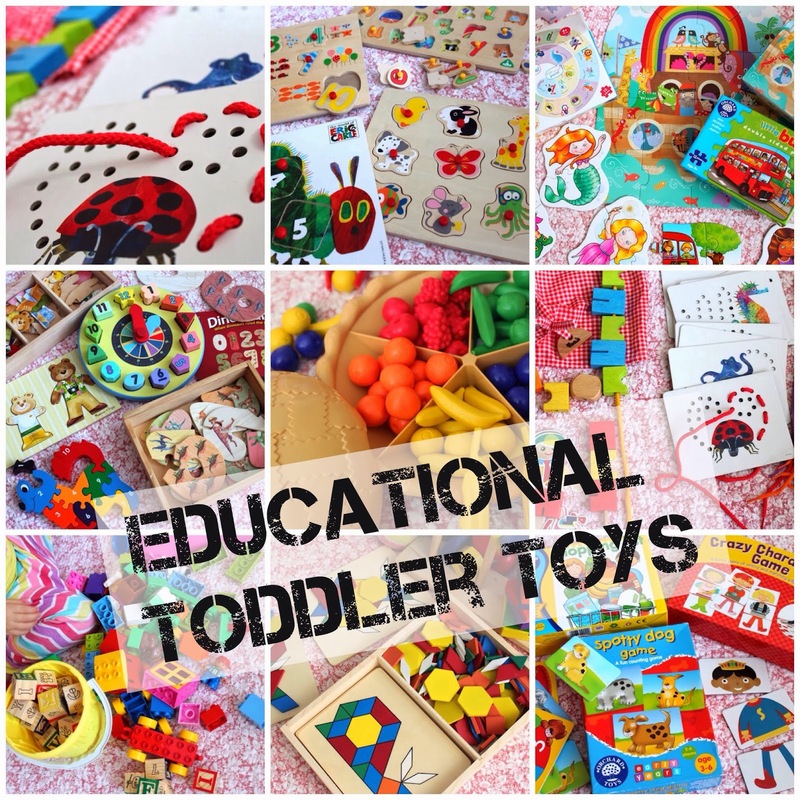 These types of toys really help with fine motor skills and hand eye coordination. I purchased the lacing cards for our flight journey in September, she can't quite do them on her own yet but she enjoys the animals and colours and really does her best. I picked up the voila set from TKMaxx as she can lace them onto the string or wooden stick which is easier and even dress them up. We also thread pasta and beads from my jewellery kit so don't think you HAVE to buy toys as most things can be DIY'd. Leaptop, My Puppy pal Violet, Lettasaurus all from Leapfrog. The laptop was for her 2nd birthday and she quickly proceeds to take it out when mama is on hers. The great thing about Leapfrog toys is you can personalise them, so the laptop says "hello Esra" and today she was singing with violet saying "I love you Esra" which is so cute. The dinosaur was for her 1st birthday and she still uses it, it helps with letter and colour recognition and also singing :) All of the Leapforg toys are fantastic and I'm sure we will invest in more as she gets older. There's a phonics set which I have my eye on! Cardboard first words and phonics Flash cards by Usbourne. Foam Letters £3 from Sainsburys. I started with the flashcards since she was a baby, I try to teach her everything in Turkish first as well as English. Usbourne do a great selection and are very appealing to young children. The counting cards are superb and have colourful objects on the reverse and Esra loves organising them and laying them out too! :) I try to use the foam letters to help with phonics and try to get her to match them up which doesn't always go down well, but we use them as bath toys too and are a great learning aid. Number train and pink brick box all by Lego Duplo. Wooden alphabet blocks from pound land. Lego lego lego, basically my favourite childhood toy. I used to play with it for hours and knew Esra had to have some. Duplo is slightly larger than regular sized lego and perfect for toddler hands. They help with fine motor skills, hand eye coordination and construction skills. We use them to make shapes, learn numbers and colours and just general imaginative play. Just as an FYI I got the train for £8.67 and the pink brick box for £5.49 in an amazon flash sale, so it's worth keeping an eye on things if you are not desperate. I use the app and it's basically an addiction! The wooden blocks were a great find from pound land and in stores now, I picked up 2 packs to have all letters of the alphabet. they have pictures on them too and make great conversational toys as well as for imaginative play. Just get some blocks, any blocks! We still use our wooden blocks from our I'm Toy walker which is another hit. Pattern blocks and boards & Geometric shape stacker both by Melissa & Doug. The pattern blocks have been on my wish list for ages, I LOVE the concept but wouldn't recommend this particular one as the paint on it has rubbed off drastically, 'Learning resources' do a similar version and looks just as good but it's plastic. This is a fantastic educational toy and one that encourages pattern matching and mathematical skills, it helps teach symmetry and colour recognition and the blocks can also be used individually for imaginative pictures. The stackers is also great, we have had this for ages now and it's one that has grown with her, it has a puzzle element and can be used to help recognise colours, shapes and even sizes, another must have for your toddler! Sorting pie by Learning resources. The drawing mat is basically activated by water, it comes with a pen that you fill and then you can draw draw draw. Whoever invented this is a genius, it's mess free and I can quickly pass this to Esra and she will get busy. Once the water on the mat dries it disappears and you can start again. We also use this to splash water on and trickle the water like raindrops to make pretty shapes and even splash our hands in water to make hand prints. The possibilities are endless and a great toy to take around with you when visiting a friend as it has no mess and folds really small. Obviously theres nothing like pen and paper but this is a great alternative if you don't want to find colourful scribbles on your walls. I have also seen some people hang this on the wall to let children draw standing up. I got this for £10 in the sale, so again peeps watch those items! That's a wrap - and breathe! FYI I am not affiliated with the brands mentioned and I'm not paid by amazon to promote anything although that would be nice, get on it amazon email me yeah *wink wink* no seriously this is an honest shopaholic mamas opinion as always. I changed my hair again *covers face* speak soon and I will be doing the play kitchen DIY post soon too! What toddler toys do you recommend? I have had my eye on a few 'Real Techniques' brushes and caved in today as they were on offer (buy 1 get 1 half price) so they cost me £15 for both. I initially dismissed these brushes when they first launched because lets face it I have enough brushes to cater for about 20 people so didn't feel I needed these in my collection. However, I am sick and tired of picking off brush hairs from my face, Mac and Sigma brushes shed like crazy so I decided it was time for some soft synthetic brushes. I opted for the 'Blush brush' which I plan on using for powder and bronzer and the 'Expert face brush' which I plan on using for liquid foundation. I needed the 'expert face brush' as I used to enjoy using the Sigma F80 brush and also the 'Everyday Minerals flat top kabuki' until they both fell apart on me. The other brushes from the sigma range are too fat and not that great. I also used to love the 'Mac 187' and the sigma dupe, but they shed like crazy and I finally binned both as they were causing more bad then good. I think I want the real techniques stippling brush too! I also popped to 'Butlers' my favourite homeware shop in Angel Islington and scored these 2 candle holders. They have now happily become my brush holders and they were only £2.99 each. I also went to H&M as they were having a small home are sale, I got a couple of cushion covers and a blanket, but I'm most excited about the nail polishes I purchased. They were cleverly placed on a stand near the tills and I saw them from the corner of my eye, I had to look twice and quickly proceeded to add them to my basket. The 3d holographic glitter just screamed at me, and the gold glitter with white speckles seemed festive and fit for December and now I can't wait to paint my nails. What have you been buying lately and what's your favourite glitter polish for the festive season?